Iraee—an accountant who was charged during a raid of her home by the Revolutionary Guards that was aimed at her civil rights activist husband, Arash Sadeghi—was granted a short furlough from prison and promised a review of her sentence by the Judiciary on the 71st day of Sadeghi’s hunger strike for his wife. Public concern for the endangered life of Sadeghi—who is himself serving a 15-year prison sentence for his peaceful activism especially on social media, forced the Judiciary to retreat from its usual hardline stance. Iraee told the Campaign that her husband could barely walk after going 71 days with no food, was throwing up blood, and suffering from serious kidney, intestinal and lung problems. “The prosecutor’s office has issued a permit allowing Arash to be transferred to the hospital, but as of 8 p.m. tonight (January 3), he’s still in prison being looked after by the clinic staff, even though he needs immediate hospitalization,” she said. 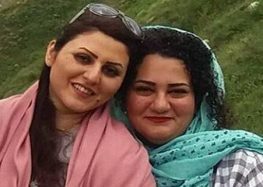 Iraee was sentenced to six years in prison in March 2016 for “insulting the sacred” and “propaganda against the state” for writing a fantastical story she never published and for a “few” of her Facebook posts. The story—which she had written in a notebook that was later confiscated during a raid of her home by the Revolutionary Guards—is about an enraged woman who burns the Quran after watching a film about stoning in Iran. She was released on furlough after posting 500 million tomans (approximately $155,000 USD) bail. She told the Campaign that Branch 33 of the Supreme Court has been appointed to review her case. On December 20, 2016 the #SaveArash hashtag became the number one trending topic on Twitter, with more than half a million participants expressing serious concern and support for Sadeghi’s plight. Sadeghi was arrested with his wife and friends Navid Kamran and Behnam Mousivand on September 6, 2014 at the couple’s stationary store in Tehran by agents of the Revolutionary Guards’ Sarallah headquarters. He was charged with “assembly and collusion against national security,” “propaganda against the state,” “spreading lies in cyberspace,” and “insulting the founder of the Islamic Republic” for his peaceful civil rights activism. He began serving his 15-year prison sentence in June 2016.